Etienne Bouet aka EDA interview by Jonathan Hay about Etienne and Mathieu Claudon’s Unconcrete Architects project. Can you describe your project Unconcrete Architects? Well, “Unconcreate Architects” is the next step of my past collaboration with Mathieu Claudon. 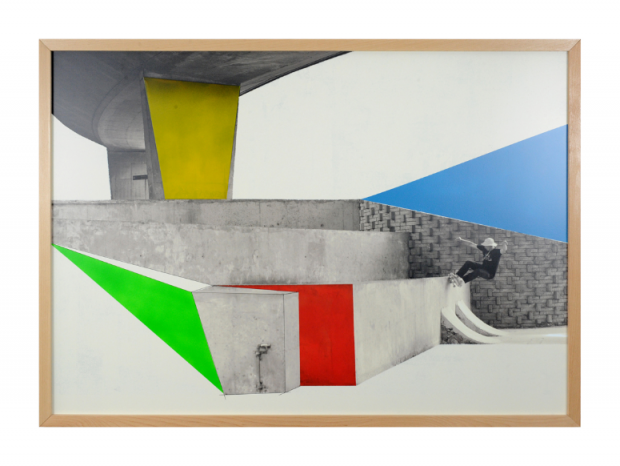 The starting point of this new series is the link between architecture and skateboarding. This time, this is the spirit of “watercolors” used by the designers and architects from the beginning of the 20th century that inspired us. We have tried to mix contemporary and urban art by using the same approach of 1920 – 1950’s artists with actual techniques (industrial paint, spray paint and Posca pens) the main thing was to keep the transparency effect of watercolor to get the grain of the surfaces and the material effects. I was really inspired by architects and modern designers like Finn Juhl, Le Corbusier, Gropius, Aalto or Eames. How did you and Mathieu come together to work on the project? What is each of your responsibilities? Mathieu shoots all the pictures, then I do the first designs on computer. We talk about it to confront our impression, after that comes the print of the photography and I can start the painting part. We didn’t really get “discovered”, sometimes you just have to push your luck. Mathieu knew a guy who works in an art gallery, he was stocked that we made a book about skateboarding and was interested about doing an exhibition about it. The book was out for more than a year, and for us, was kind of a past thing, as we were not 100% satisfied about it and the way the editor took care of it. Mathieu shows the gallery what we were working on with “RED XV” and few months later we were running our first full exhibition. Which artists influence your design artwork? 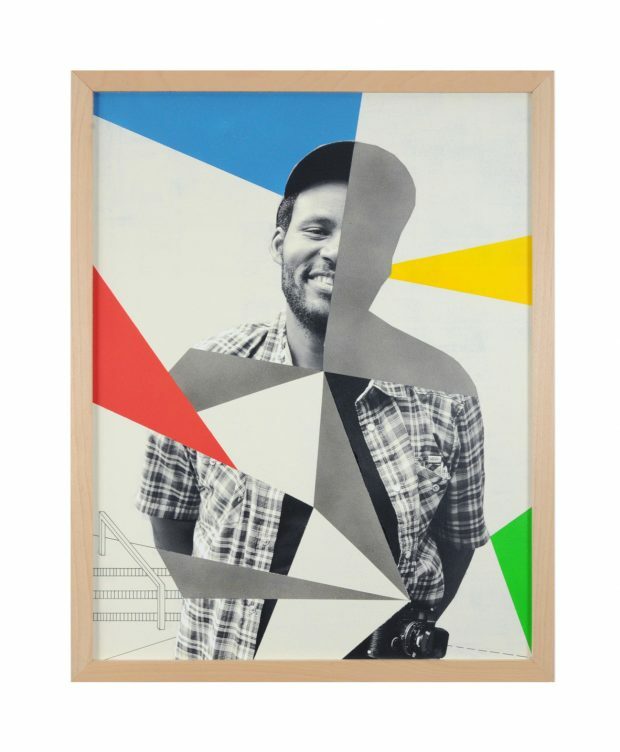 I like different kind of art: contemporary art, design, architecture, lowbrow, graffiti… My main influences come from artists like Roy Lichtenstein, Boris Tellegen, Tilt… But I love Vhils, Todd Francis too. There are so many good artists. For these series, Finn Juhl is the artist who has inspired me the most. I have seen a lot of exhibitions and read a few books about plans of architecture and design but the book « Watercolors » of Finn Juhl was the starting point of “Unconcrete Architects”. I was in Copenhagen to visit the city. I bought the book « Watercolors » about Finn Juhl‘s work in the museum of design. Back home I started painting watercolors on Mathieu’s photographies. After eight months of different tests, we found the final style of the series. Which photographers influence Mathieu’s photography style? 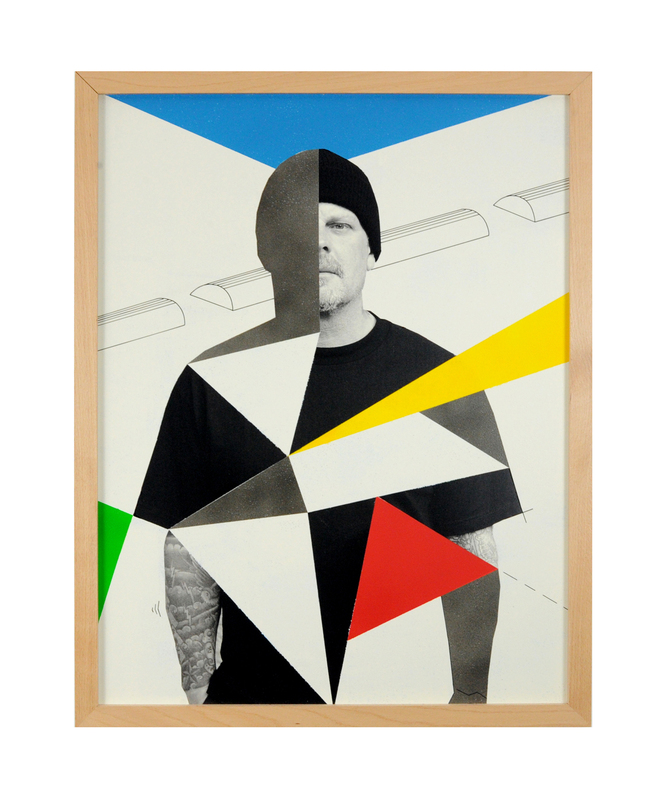 Mathieu started skateboarding in 1988 after buying a skateboard magazine. His first contact with real skateboarding was from the photography of magazines and he was instantly hooked up by the images. His main influences came from the clichés of the late 80’s and beginning of the 90’s. I know he particularly respecst the work of Daniel Harold Sturt, J. Grant Brittain and, of course, Glen E. Friedman. Their pictures marked him for life and inspired him a lot. I think this is the reason he likes black and white so much. Tell us about the books you made about skateboarding “Skateurs Ordinaires” and “Paris, Skate in the City”? 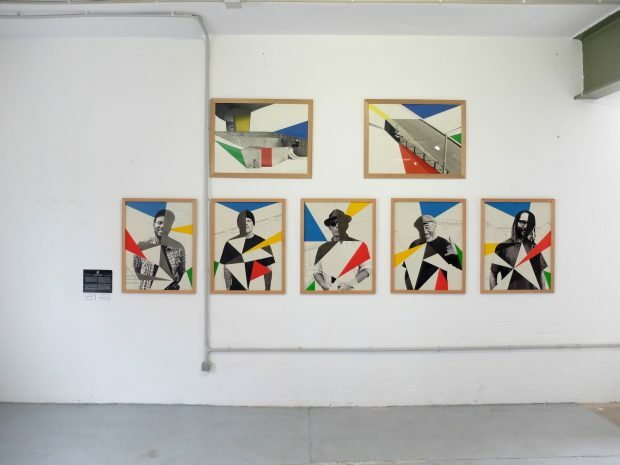 “Skateurs Ordinaires” was a very personal project. After quitting the music industry I was in need to do something creative. Skateboarding has always been a part of my life, but I never had the opportunity to do something in the industry or for skateboarding. I had this idea, in the back of my head, for a long time, to do something different, to talk about the “ordinary skateboarders”, not the guys from the magazines, not the “athletes”, just the fellow riders you can cross in every city. It’s not about the performance or the style, just the love of skateboarding and how this has influenced our lives, this plank of wood and all the culture it vehicles. So “Skateurs Ordinairs” is about the skateboarding history, from the late 80’s to now, but by my eyes, the ones of an ordinary skateboarder. Following “Skateurs Odinaires”, an editor contacted me. They wanted to do a book about skateboarding if I could bring an idea. I had met Mathieu by the end of the making of Skateurs Ordinairs as I was looking for photography and archives to finish the book and we had clicked well. I talked to him about this new opportunity and offered him to work together on this. Except for the portraits of Ray Barbee, Steve Caballero, Dressen and Christian Hosoi and the two skate photos in your most recent exhibition, what other pieces are you working on together? We are mainly working on skate photos; this is the real concept of “Unconcreat Archiects”. Portraits are just here to complete the project and were a great way to tease on all that we’re bringing next. There’ll be a other small exhibitions in skate related places by the end of the year, preparing the full exhibition in an art gallery in Paris in February 19. Stay tuned!!! Where did you meet Barbee, Caballero, Dressen and Hosoi? Following skateboarding events for years we have crossed the path of a lot of pros and Mathieu has a great collection of portraits of skate legends. 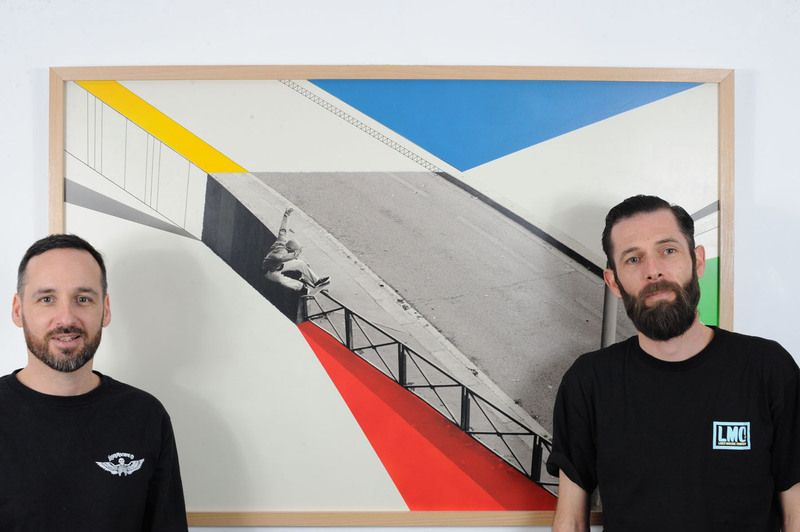 For Ray and Cab, the portraits were shot in Amsterdam, during the Vans Downtown Showdown a few years back. Hosoi was shot in Paris during a store appearance. For Eric, we followed on Instagram for a longtime, have talked about working together and finally met during a Euro Santa Cruz tour last summer. 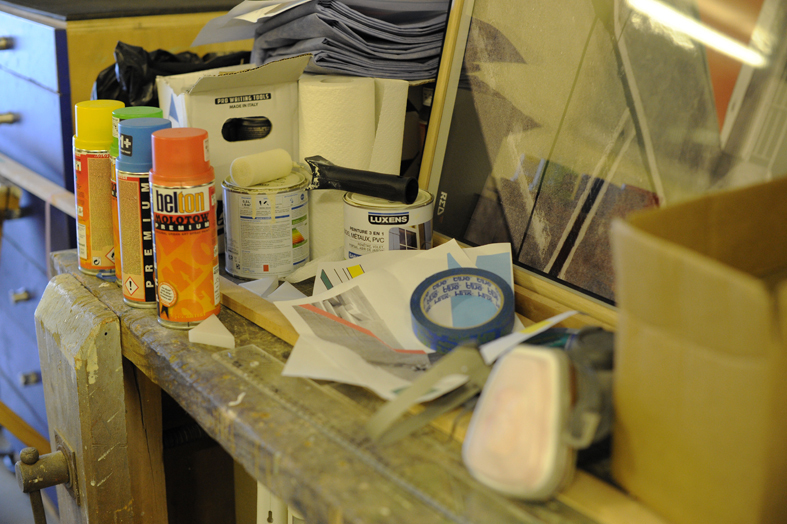 What are your plans for your next artshow? We are working on a small exhibition for this fall. And we are preparing the full exhibition Unconcrete Architects in an art gallery of Paris for February 2019. 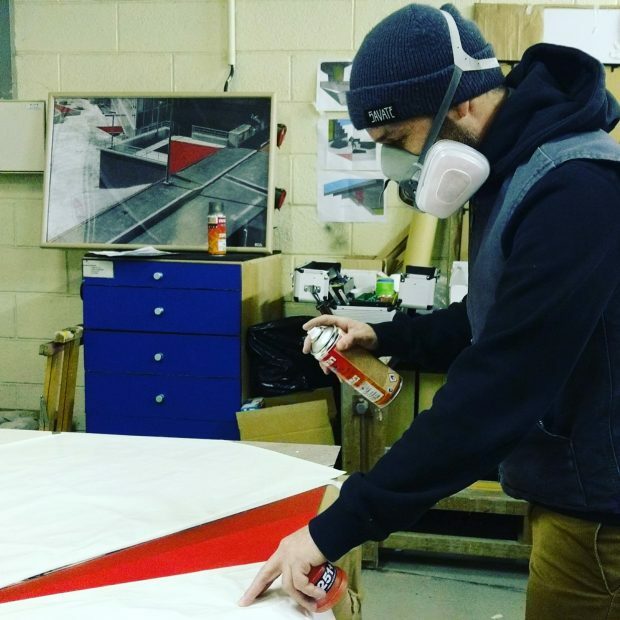 By the same time, we’re making a board for a charity “Learn and skate” which will be the next event in Denver, Colorado in September. How was your artwork received by the audience at the Wheels and Waves show? It was a kind of last minute thing. Submissions were closed when we contacted the Artride guys to propose them our work. Seems they liked what they saw as we were invited to be part of the show. We got a great feedback from the public as from Steve and Christian who were happy to see our work live. Any advice for upcoming artists that want to do art shows or make books? DON’T!!!! Just kidding! Art is also as thankless as skateboarding. It takes a lot of time and effort to learn and improve yourself. As in skateboarding, everything’s up to you, you always have an option to choose what you want to do. It’s OK to take a fall, if you have good intentions, as long as you give it your all, you’ll feel good inside. You just got to find out what you want to do. It’s all in you. Find a concept first, then make it grow, make it evolves. If you’re passionate about it you’ll be able to talk about it and share your love of it. The rest is only a lot of marketing, a bit of luck, and great meetings. French artists Mathieu Claudon and Etienne Bouet reveal a pre-production of the new project called ” Unconcrete Architects “. 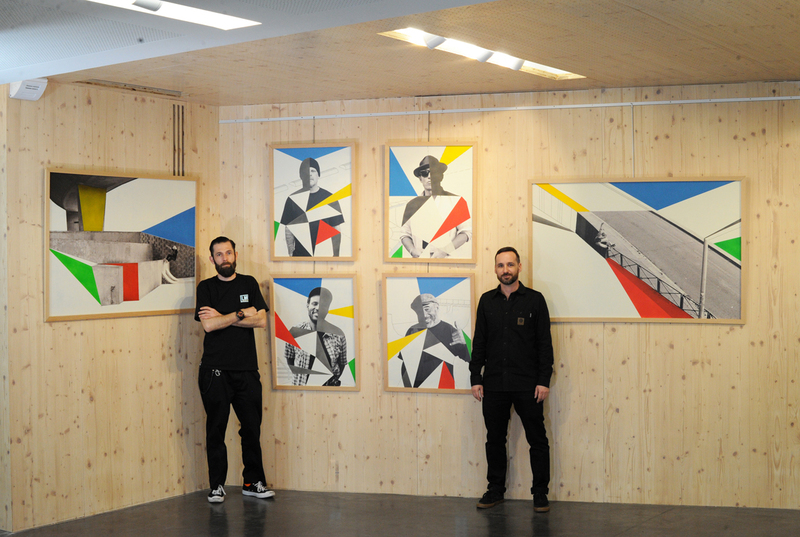 As for their previous exhibition, ” Red XV ” in 2017, the starting point is the connection between architecture and skateboard, this last considered as an art of movement and as a culture. This time, it’s the spirit of ” watercolors ” used by the designers and architects of the beginning of the 20th century, which is the project’s guideline. 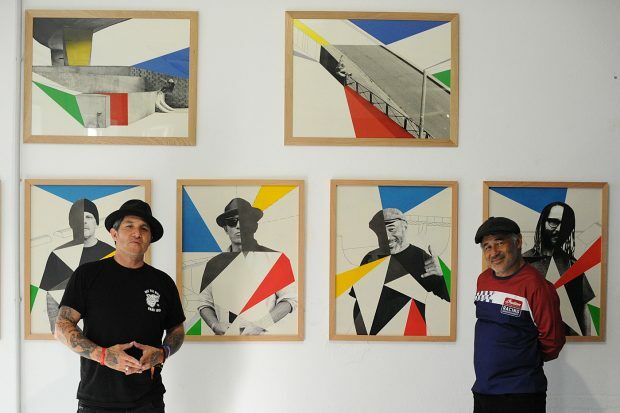 Based on photographic portraits, the skateboard legends of the 80’s, such as Steve Caballero, Christian Hosoi, Eric Dressen and Ray Barbee, are represented with their favorite playgrounds, behind bottom. 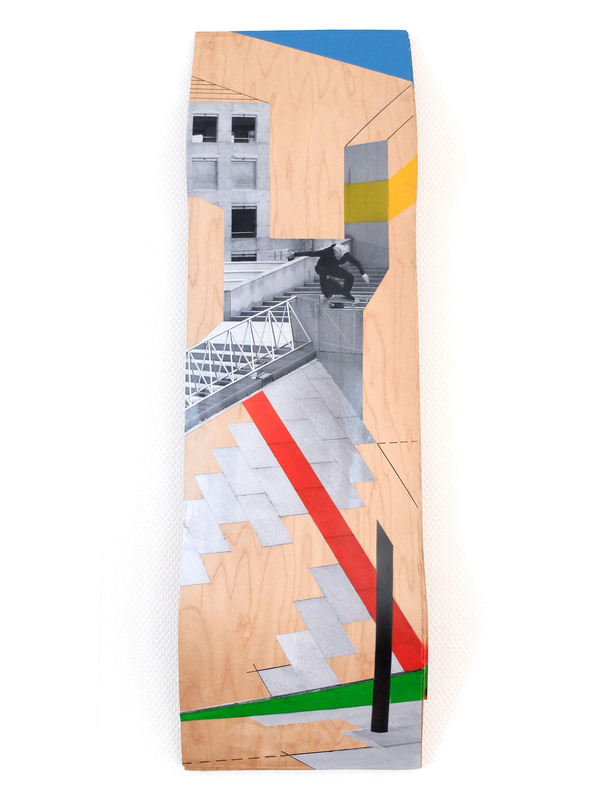 Here, the iconic skaters are considered as ” architects ” of skateboard such as Le Corbusier, Gropius, Aalto or Eames. Both artists pay tribute to the idols of their youth and their historic spots. Mathieu Claudon and Etienne Bouet play with the limits between contemporary art and urban art : on one hand, by their approach reminding that of the artists of the years 1920 to 1950, and on the other hand, by using current techniques as industrial painting, spray painting and posca. The important is to keep the effect of transparency of watercolors to preserve the grain of covered surfaces, letting appear the effects of materials. The spirit of modern architects, Finn Juhl and Bauhaus, is not very far. Mathieu Claudon and Etienne Bouet do not seem to choose between classicism and modernity. 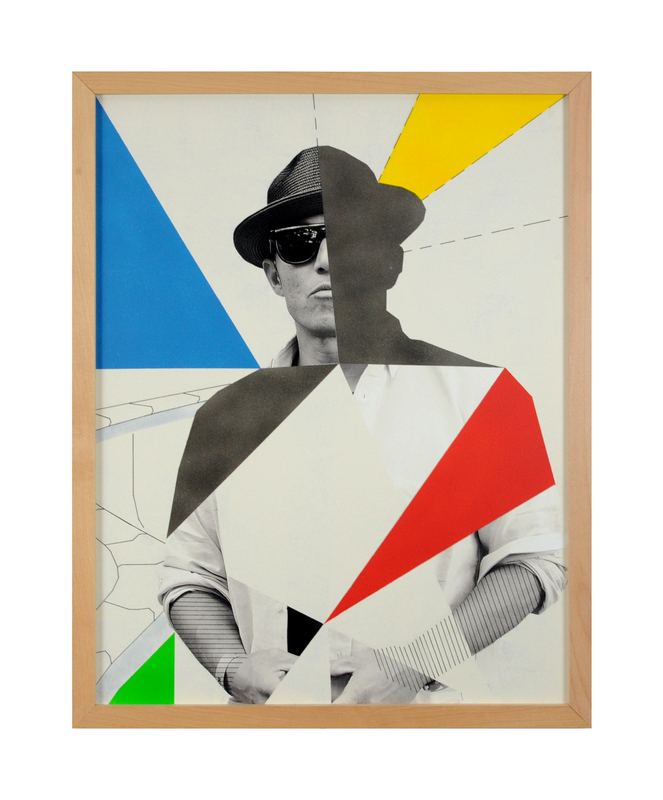 Etienne BOUET (EDA) is a french multiform, jack-of-all-trade and self-taught artist. After ten years working in music industry as a musician, producer, sound engineer, he contributes to various graphic projects (collages, creating logos and visuals…). His interest is mainly focused on contemporary art, architecture and photography. 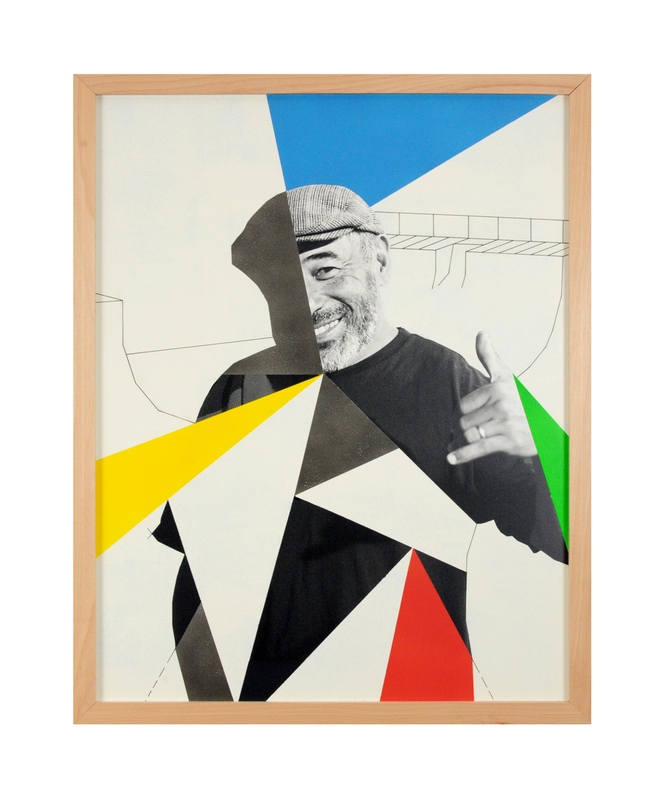 Artists from different universes such as Roy Lichtenstein, Le Corbusier, Boris Tellegen or Tilt inspire him. 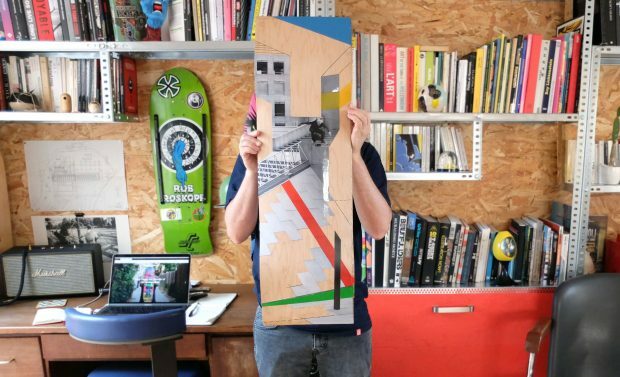 Recently, he also made two books about skateboarding : Skateurs Ordinaires and Paris, Skate in the City (mixing Skateboard and parisian architecture). Red XV exhibition is a turning point in his reflexions. For this contemporary art project, he starts painting red and black color fields on Mathieu Claudon’s pictures. 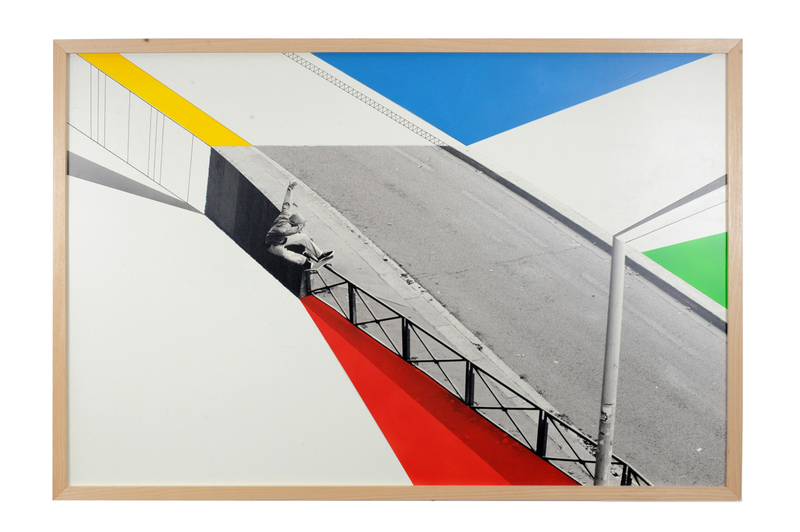 Coloured works of the new series are the obvious result of this collaboration. Mathieu CLAUDON is a parisian photographer. He’s specialized in skateboarding black and white pictures. Paris , Skate in the City book’s release confirms his talent thanks to these pictures of the french capital. Advocate photographer for Electric California (France), put forward by Lomography for his Petzval lens and contributing photographer for The Skateboard Mag ‘s magazine, he goes on evolving and expanding his photographic world. 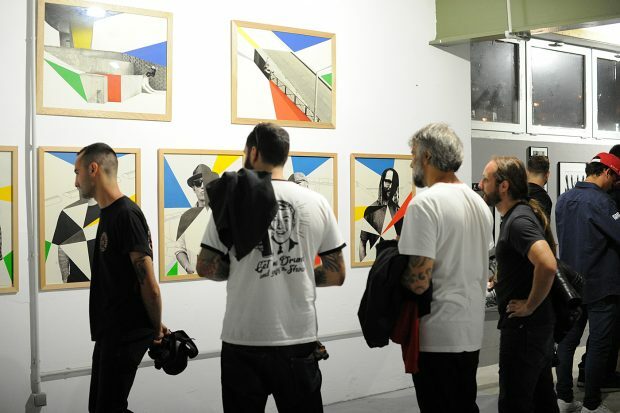 Recently, he exhibits in the parisian Obey Pop up store, a dozen pictures of Shepard Fairey’s coming in Paris and works. With Red XV and now Unconcrete Architects, his work about perspectives and lines tends to create a simple but powerful mood.